This 773m2 enchanting 4 bedroom Bali style home has a 4.5 Bathrooms, 3 Garages, 3 Reception rooms and a bar. Spacious reception areas, a lot of area for recreation and relaxation, a huge integrated garage, well-appointed bedrooms and a very wide patio is what this 773m2 architectural design features. 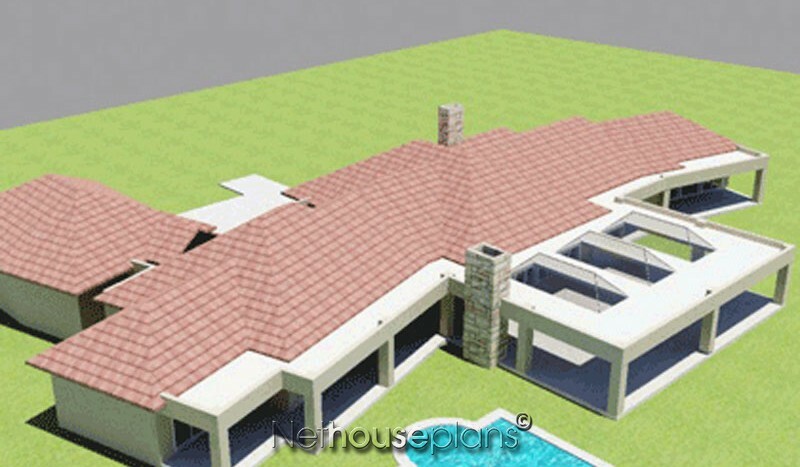 This single level enchanting 4 bedroom Bali style home design has it all. From the entry hall, a hall way leads through to the bedrooms and another to the living and reception areas. Near the entry hall, the lounge area is positioned in the middle of this enchanting 4 bedroom Bali style home design for convenience. 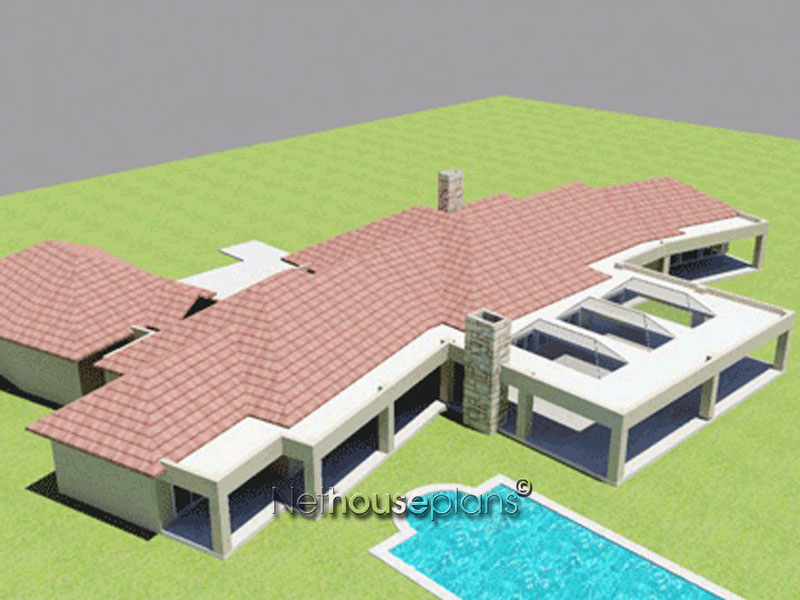 The lounge area is sunken from the rest of this enchanting 4 bedroom Bali style home design. On the side of the lounge there is a bar. This feature make it easy for you to serve a cold drink to your visitors. The lounge area, being close to the entry hall is the perfect place where you can welcome and entertain your guests. The lounge area has a folding panel door installed in it providing illumination and a beautiful view of the outside. A fireplace is installed in the lounge to ensure the occupants are kept warm at all times. Near the lounge area, you can whip up your guests a delicious snack in your beautiful kitchen. This is possible because of the open plan layout of the kitchen and the lounge area. The kitchen is big. With lots of room where you can prepare and cook your specialties and still have more than enough space for storage of kitchen equipment and supplies in the pantry. The breakfast counter in the kitchen offers a convenient space where you can meet and chat in the morning while tucking in to that nutritious meal. A scullery is also connected to the kitchen which offers additional space for storage of other household supplies. The scullery is usually installed with a double sink for dish washing purposes. The scullery has an access door leading to a courtyard making it easier for you to take out the trash. Beside these areas are the dining room and family room. The dining room is elegant and with its wide windows, your dining experience will be a lot more enjoyable. The dining area is a great place to share those meals with family and friends and having the kitchen close by, it ensures that your meals remain warm when served. The dining area flows through to the family room. The family room is big. Here you can gather all family members and spend some quality time with them. The family room is illuminated by three folding panel installed in it that also provides a beautiful view. On the other side of the hall way, you will find the bedrooms. There are three extra bedrooms in this enchanting 4 bedroom Bali style home design and each one has a folding panel installed in them providing each room a convenient exit and a beautiful view. Two of the bedrooms share a common bathroom while the other one has access to its own. Near the extra bedrooms, a passage leads to the integrated garage. This integrated garage can fit not only one, but three vehicles and still has room for extra storage. The internal access in the garage is great feature because it ensures that, you can easily get from your car and into the house without getting wet especially during rainy days. On the other side of this enchanting 4 bedroom Bali style home design is the master bedroom. This bedroom is so spacious that it allows you to put a couple more furniture to create your own private lounge area. This en-suite bedroom has access to a wide walk-in closet and a private office. The office can also be accessed from the passage leading to the master bedroom. The office allows you to have a private space where you can do your work and an access door leading to the courtyard ensures you get a breath of fresh air when you need one. The master bedroom, along with the family room, the lounge area, the bar and all three extra bedrooms, have access to the patio. The patio spans from end to end and offers a lot of space for accommodation. 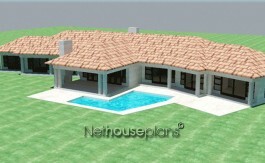 This feature ensures everybody can access the patio from anywhere in this enchanting 4 bedroom Bali style home design. The patio is a great place to spend a sunny day with family and friends enjoying a good barbecue. 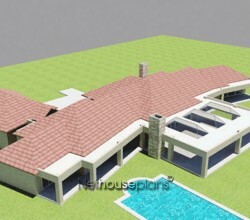 A spacious, elegant and enchanting 4 bedroom Bali style home design that is perfect for your family’s needs.